After years of using your monkey fists like a chump, Facebook is now working on a device that will allow you spew status updates directly from your mind—no typing, or single moment of reflection while the impulse travels from your cortex to your fingers necessary, ever again. It’s an innovation that could allow for much easier internet communication for people with disabilities, as well as for people who find their current, physically distinct relationship with Facebook far too cold and distant. The initiative was unveiled at a recent presentation during Facebook’s F8 conference, where Regina Dugan—a former director of DARPA who now heads up Facebook’s neighborly-sounding Building 8 lab—revealed that the company has tasked 60 engineers with designing a brain-computer interface, one that will allow you to type up to 100 words per minute, just by it reading your mind. If all that sounds somewhat ominous, Dugan reassures everyone that the process won’t involve invasive implants. Rather, Facebook will simply use optical imaging to scan your brain 100 times per second, listening to your innermost thoughts, then translating then into text right in front of your eyes, your followers, and Facebook’s consortium of targeted advertisers. But again, definitely no implants! “Implanted electrodes simply won’t scale,” says empathetic human person Regina Dugan. Still, rest assured that Facebook is in no way intending to use its mass-marketed mind probe to read all of your thoughts. “This is about decoding the words you’ve already decided to share by sending them to the speech center of your brain,” Facebook says in its official announcement. “Think of it like this: You take many photos and choose to share only some of them. Similarly, you have many thoughts and choose to share only some of them.” Thus, users who have long relied on seeing only the photos of themselves that they want to see on Facebook can take comfort in knowing that the same safeguards will be applied here. Of course, there are some who might say that it’s really difficult, if not downright impossible, to develop a device that listens your thoughts, but also boasts the Southern-bred gentility to politely ignore some of them. Vox spoke to MIT neuroscientist Rebecca Saxe, who says it’s simply not plausible for current technology to pick up only on specific thoughts or words in the brain’s speech center, as Dugan claims its sensor someday will. At the moment, the best-case scenario is a keyboard hooked up to an EEG that will allow you, with intense concentration, to focus on one letter at a time, typing at a rate so sluggish, you’d simply become exhausted before even getting through the first line of your post about why Bernie would have won. Nevertheless, Dugan seems confident that, with its team of scientists and engineers working around the clock over the next two years, it can develop a prototype that will allow such thoughts to pour out of you directly onto your Facebook feed unimpeded, where they can do the most good. Still, are there perhaps negative implications of allowing a social media giant known for relentlessly mining your demographical info, just so that it can sell you things more efficiently, to have a direct line into your brain? Don’t worry your pretty little speech center about it. 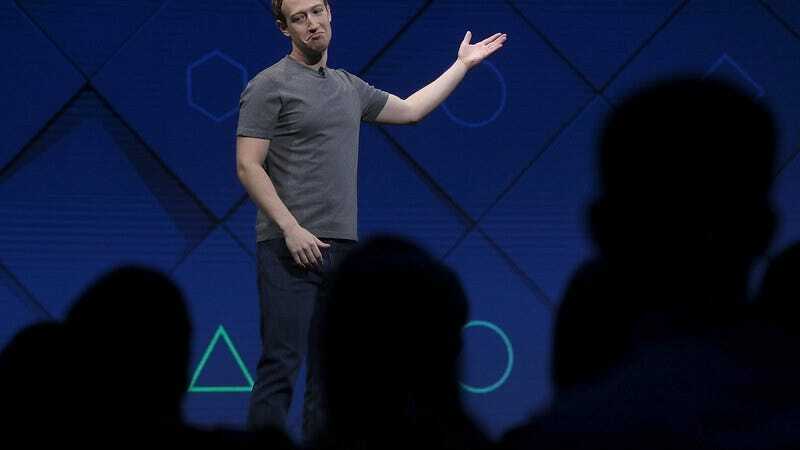 Business Insider says “Facebook plans to form an ethics and legal panel with Building 8’s outside university partners to examine the privacy and health implications of brain scanning.” So you don’t even have to think about that! Facebook will do all the thinking for you.